A used Styrofoam container lies crushed on the pavement in Oakland, California. San Francisco doubled down on its Styrofoam ban Tuesday, outlawing all forms of polystyrene foam in what local policymakers are calling the most expansive ban in the country. 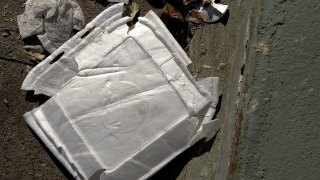 San Francisco on Tuesday adopted the nation’s most extensive ban on Styrofoam, according to the supervisors who sponsored the legislation. The Board of Supervisors unanimously voted to outlaw polystyrene foam, better known by its brand name, as it relates from everything from egg cartons to buoys as of Jan. 1, 2017. The old legislation, enacted in 2007, banned the product as it related to food packaging. Now most every product made of Styrofoam — down to the beach coolers sold at the grocery store — are now forbidden in San Francisco. Penalties range from $100 for the first violation to $500 for the third and each subsequent violation, according to the board. The hope, city leaders say, is that more companies will begin using organic and compostable packaging materials. The reaction was swift on both sides. "Awesome!," wrote Kassondra Grayson. "If only the rest of the state would follow." On the other side, came this rhetorical question from Mariah Smith: "What can you do in San Francisco?" More than 100 U.S. cities and many states have ordinances restricting polystyrene food service ware and packaging materials. But San Francisco now has the "most expansive Styrofoam prohibitions in the country," said Board of Supervisor President London Breed, who introduced the legislation on Earth Day in April along with Supervisor Aaron Peskin. "The science is clear," Breed said in a statement at the time. "This stuff is an environmental and public health pollutant, and we have to reduce its use. There are ample cost effective alternatives to Styrofoam on the market." Some industry groups have criticized the crackdown on polystyrene foam, saying it's still the most reliable form of packaging, and that environmental efforts aren't as great as supporters contend. "I’m appalled," said Betsy Steiner, spokeswoman for EPS Alliance in Maryland, which represents manufacturers who make packaging materials out of Styrofoam and polystyrene. "We’re opposed to the plan. There are serious errors in their statistical representation." She said her group is considering whether to take any legal action against San Francisco, and is worried it will inspire similar legislation in other areas. Steiner said such a sweeping ban is unprecedented, noting that the city of San Francisco did not take into account any of her group’s written statements or counterarguments to its scientific data. Spokeswoman Lisa Dry said the American Chemistry Council is also adamantly against San Francisco's ban, and disputes the supervisor's data, saying that polystyrene foodservice packaging is quite safe. The California Grocers Association has also been wary of the ban, with members pushing for more time to switch from Styrofoam to eco-friendly alternatives, according to Guillermo Rodriguez, spokesman for San Francisco's Department of the Environment. As a result, the law won't take effect until next year. Polystyrene foam never biodegrades, pollutes the bay and contains harmful chemicals, according to information released by Breed’s office. Rodriguez said he expects most businesses to comply, as they did with the state's ban on plastic bags. "This ordinance is one of the strongest in the country protecting both the environment and public health," he said. "The ordinance is a good model for other local governments to follow."